Three print heads are aligned in stagger, allowing for the high speed printing of about 40m²/h even with the standard print mode. The ink supply system and the media feeding system achieve the stable unattended printing. With the high speed printing, the better productivity is accomplished. Mimaki's UISS (Uninterrupted Ink Supply System) will automatically switch whenever one ink container is empty to the other ink container of the same color. In addition, operators can exchange the ink containers even when the printer is at work. Therefore UISS enables long continuous print runs. 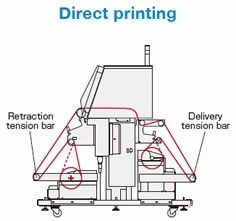 Web tension is ensured by movable delivery/retraction bars that absorb tension differences and stabilize substrates so that high quality printing is made possible. substrates, please test beforehand and chose the appropriate drop size for each substrate.